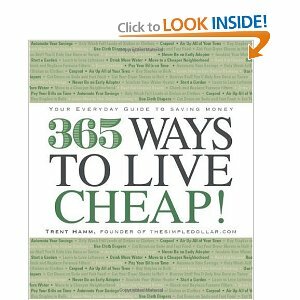 Since this blog focuses on saving money and paying off debt, I thought that a terrific giveaway would be this handy book by Trent Hamm, Founder of The Simple Dollar. I had read about this book over at another financial/money blog and I really enjoyed the very simple, down-to-earth advice that is found in this book. From practicing good gas conservation habits to learning to love leftovers, this practical guide helps you pinch pennies to live large!" One My Money Mission Reader will win a brand-spankin' new copy of this book! All you have to do to enter is leave a comment letting me know your favorite frugal tip. I Hope you all are having a terrific Thursday! I have a wonderful concoction that I use to polish my wood furniture with - and it costs a fraction of what I would spend in the store for a similar product. Mix together - use a small amount on a soft cloth. An old clean cloth diaper is perfect! After applying rub off and buff with a dry soft cloth. One way to live even cheaper is to check that book out of the library (for free) instead of buying it. Our local library has videos as well, for free, to borrow. Cheaper than Blockbuster, or even Netflix. No expense is too small to scrutinize. Even for people making $100,000 a year, perhaps only $10,000 of that is "disposable income". So if you can save $100 here and $100 there, you can easily increase your disposable income by 10% or more, which is a staggering amount. And there is no income tax on cutting costs! To make the equivalent of a dollar saved in cutting costs, you'd have to get a raise of $1.50 to cover the taxes. But I try to avoid buying financial self-help books. Buying things to save money is sort of like eating more to lose weight. It defeats the purpose of the exercise. Good luck with your efforts! I just paid off all my debts this month. It is a nice feeling. Robert...I am have a teeny confession to make...I bought this book at a fraction of the asking price...I rarely ever pay full price for anything. I am also very picky about any type of self-help books but I definitely enjoy The Simple Dollar; that's why I was drawn to this book. I really like you this statement, "And there is no income tax on cutting costs! To make the equivalent of a dollar saved in cutting costs, you'd have to get a raise of $1.50 to cover the taxes." My favorite frugal tip is to shop sales and use coupons....for everything. A frugal tip....grow your own food. Even if you have no land and live in an apt., you can find a pot, some dirt and sow some seeds. Not only is growing your own food frugal, it can be better for you since you can control what is put in or on your plants. Plant easy to grow things if you don't know how to garden and plant things you like to eat. Plant veggies that cost alot to buy at the store-like salad greens. They are super easy to grow and by weight are very expensive at the grocery store! I entered your Hamburger Helper giveaway too. And I entered your Mozaik giveaway as well. My Krups coffeemaker died. Would grind but not perk. Checked problem online. Bought overtemp fuse online for $3.50 including shipping. Saved $200. NO USER SURVICABLE PARTS INSIDE ?? B.S. Fuses are user servicable.